A new wave of tornadoes has hit at least six counties in the central US, a day after a massive tornado devastated a small town in southern Kansas. One man was killed in the latest storms and 11 people injured in another Kansas town. More severe weather is expected. Rescuers are searching for survivors of the Greensburg tornado, which killed nine people and injured dozens more. 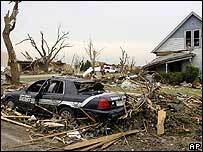 US President George W Bush has declared parts of Kansas a disaster area and has pledged federal aid for reconstruction. "I'm confident this community will be rebuilt, to the extent we can help, we will. "The most important thing now is for our citizens to ask for the good Lord to comfort those who were hurt," the president said after attending church in Washington on Sunday. Kansas Senator Pat Roberts, who toured the devastated region, said: "It is no understatement or overstatement to say this town has been wiped off the face of the Earth." There were eight confirmed reports of tornadoes in Kansas overnight on Saturday. A man died in Ottawa County, 250 miles northeast of Greensburg, state officials said, and 11 people were injured in the town of Osborne when a tornado hit two restaurants. Warnings were issued overnight for Texas, Oklahoma, Kansas, Nebraska, South Dakota and Iowa, with reports "well into the double digits" of tornadoes touching down. The new storms forced rescuers to abandon search efforts in Greensburg, around 120 miles (200km) west of Wichita in southern Kansas, which received a direct hit late on Friday. At least eight people died in Kiowa County, where Greensburg is located, and one in the neighbouring Pratt County, as winds of up to 250mph (400km/h) tore buildings from their foundations and uprooted trees. The tornado was described as a "wedge", a particularly wide formation said to be - in this instance - at least one mile in diameter. Greensburg has now been evacuated of its 1,500 residents, who have been instructed not to return while emergency workers search for survivors. Shelters have been set up in nearby towns and National Guard soldiers have been sent to the area to provide security. City Administrator Steve Hewitt estimated that 95% of the town had been destroyed. One of the few buildings still standing is the courthouse. The city hall, schools, businesses as well as homes were destroyed. Mr Hewitt said it could take days for rescuers to reach survivors trapped in basements and under rubble. He warned the death toll could rise.